I don't care how cheesy the "watch me flip a shrimp tail into my hat", "ahhh Japanese spaghtetti! (bean sprouts)", or flaming onion volcanoes are. I don't care if our good friend Jennifer who is half Japanese, grew up in Japan, and speaks fluent Japanese tells us that this is a completely American institution. I never get tired of it! One of the standard items that you find at these joints is the sweet golden shrimp sauce they serve for the seafood appetizers. Here is the version that we have used for years. It tastes pretty darn close to the many we have had. Mix all ingredients together and chill for 4 hours. 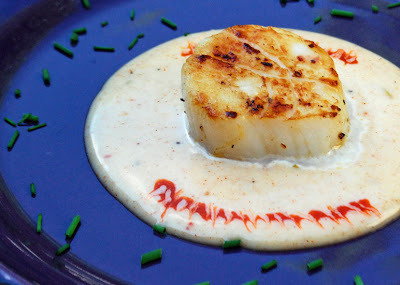 Serve with grilled shrimp, scallops, etc. The picture is from tonight. I seasoned a few scallops with just salt and pepper. Then I pan seared them in a cast iron pan. I spooned some of the shrimp sauce onto the plate. The red flame? I kicked the sauce up by drawing a thin line of sriracha sauce in the shrimp sauce. I made the "flame" effect by dragging a toothpick through the line of sriracha sauce. Wow! This is a dynamite combo. The shrimp sauce hits you up front with a "sweet" and then the sriracha kicks in with "heat" on the back end. Perfection, in my not so humble opinion!